Say so long to this stinky beast with these smart moves. Nocturnal and relatively shy, skunks aren’t often seen—but they certainly are smelled! Though the black-and-white creatures aren’t innately antagonistic, they will spray people or animals if they feel threatened, leaving behind an awful odor that can linger for days. Even if they don’t make a big stink, skunks are likely to plunder your garden and even make a mess of your garbage. Bottom line: It’s hard for humans to co-exist with these cute but fetid critters, so if you suspect a skunk has taken up residence nearby, try this two-part eviction strategy. PART 1: Stop the smorgasbord! 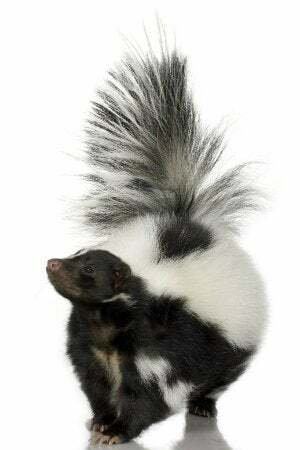 Insects are a skunk’s favorite dish, but the opportunistic animals will dine on pretty much anything. Completely cut off their food supply, and they likely won’t stick around. • Cover trash cans with tight-fitting lids and place them in a secure location where they can’t be easily tipped over. • Regularly tidy up fruit and nuts that have fallen from trees on the property to keep skunks from scavenging. • Don’t let pet food become pest food. Feed your pets indoors, or clean up any leftovers as soon as mealtime is done. Also be sure to supervise your pets outside. 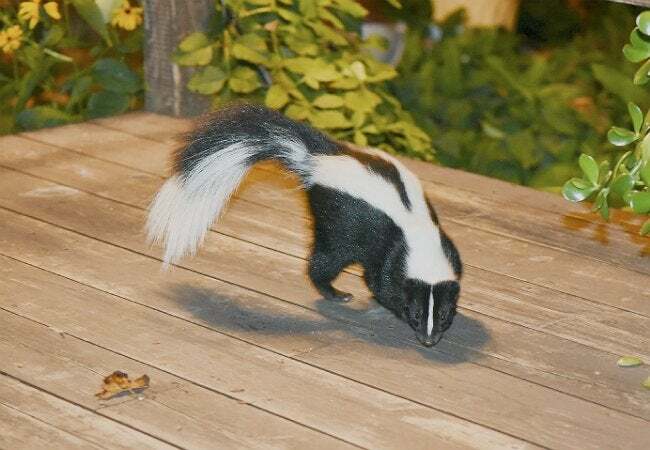 Remember, a skunk’s only real defense is his foul smell, so cats and dogs that get this guy riled up are likely to come home stinking to high heaven! • Avoid putting kitchen scraps in your compost and keep it well covered until the skunk moves on. • The seed you offer to attract songbirds can inadvertently make a tasty snack for skunks. Secure feeders to ensure they can’t be turned over, and be conscientious about cleaning up any spilled seed. • Need another reason to mow the lawn? Skunks love the insects that live in tall, lush grass. PART 2: Deter like a demon. After removing all food sources, employ the following techniques to get skunks to vamoose even more readily. • Skunks are poor climbers and worse jumpers, so a 3-foot fence ought to keep them out of areas, like your garden, where they’re unwanted. Just be sure that whatever you install goes at least a foot deep; skunks are excellent diggers and could easily burrow under a shallow barrier. Make it a tight fence, too: Though about the size of a large house cat, these critters can squeeze through a hole as small as 4 inches wide! • Commercial skunk repellents are available in stores and online, but why not make your own? Boil a chopped onion, a chopped jalapeno, and 1 tablespoon of cayenne pepper in 2 quarts of water for about 20 minutes. Strain the liquid into a spray bottle and squirt plants to make skunks steer clear. Each dose should last up to five days. • Skunks are nocturnal, foraging at night, and are scared of bright lights. Leave your exterior lights on or install motion sensors that will turn on when pesky prowlers cross their path. If these methods fail to solve a stubborn skunk who’s made its den on your digs, you may wish to contact a wildlife control professional who will trap and release the animal away from your home. Because skunks can carry rabies among other diseases, it’s definitely not worth trying to do yourself (note: trapping skunks is not legal in every state). Do be persistent and eventually your outdoor space will have the sweet smell of success! Should you manage to get your black-and-white guest to move on only after he leaves his signature scent, freshen up using our guide to removing skunk smell from almost any part of the house, or check the video below.